Are you ready for a completely new approach to customer loyalty? Designed for busy business owners. Based on 20 years of data. Wilbur is a new, ultra-simple loyalty program designed for busy business owners who don’t have extra time to spend managing a loyalty program. It’s easy for your employees to use and no extra equipment is needed. It’s perfect for your customers, too: shoppers who don’t want another registration form to fill out, card to carry, or app to download.Wilbur uses phone numbers and SMS texts so anyone with a cell phone can participate. Wilbur is not a “coalition loyalty” program (meaning points are earned at multiple businesses and rewards are spendable everywhere). Instead, Wilbur has the advantage by offering customers a consistent experience at all participating locations, but each business defines their own unique reward structure and point balances are specific to each business. You benefit from increased participation because customers know what to expect, plus you keep the ability to create and control your own program. Not all loyalty programs are designed to deliver results. In fact, the average household in the United States is part of 30 different loyalty programs, but 54% are inactive (Colloquy Loyalty Census). Driven by over 20 years of loyalty program experience and research data, Wilbur is designed with the key traits of a successful loyalty program. ● A clear program structure makes it simple to understand. ● Frequent rewards plus few rules/exceptions keep customers happy. ● Keeping it ultra-convenient and fast encourages participation. ● Employees need very little training, making it easy to implement. ● It’s easy for customers to join and interact with the program. Wilbur is easy to use and totally business-friendly. It’s perfect for businesses who want the results of a successful loyalty program, but don’t want to invest the time and energy training employees and analyzing data. ● Automated member registration—no data entry! ● Doesn’t require any program management. ● No complicated employee training. ● Gets results without ongoing time investment. You control everything about how and when customers earn rewards when they shop with you. Your program is totally custom. Whether you want to offer points per visit, per dollar spent, or offer rebates, you can with Wilbur. Learn more. We provide Wilbur signage you can display at your business to show customers that they can earn points when shopping with you. Wilbur is designed to increase participation rates and encourages customers to become repeat buyers for local businesses, which, in turn, helps your business grow. 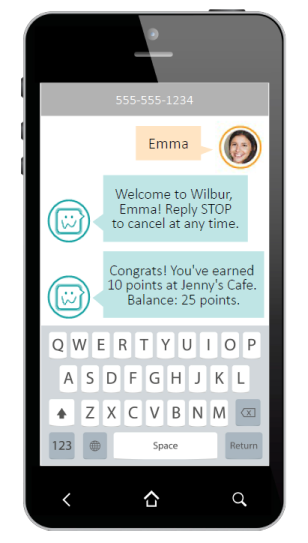 To join Wilbur, your customers just text their first name to your Wilbur number. No lengthy forms to fill out. No annoying marketing messages. They can opt out at any time. 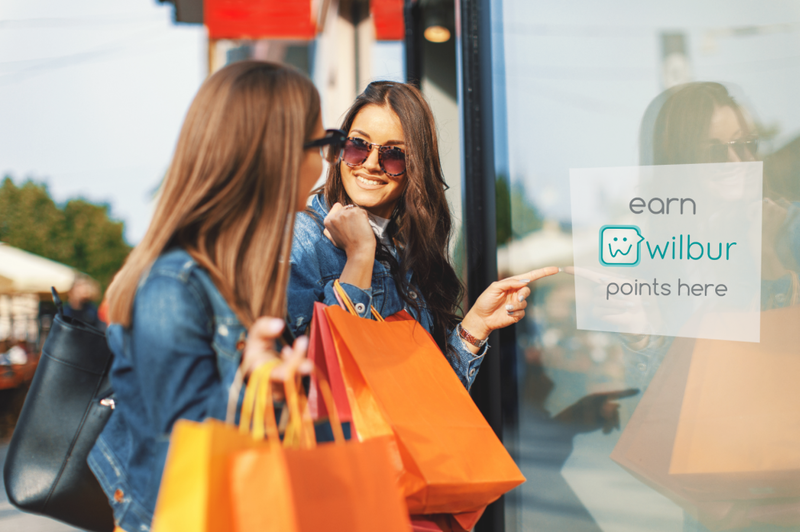 When shoppers join Wilbur, they can start earning points at all participating Wilbur businesses. To earn rewards, customers give their phone number to the cashier during checkout. Our system automatically tracks separate rewards for each store, but the same phone number is used everywhere. Customers receive text messages with an updated point balance only when they earn points or rewards. Rewards are stored with each phone number. To redeem rewards, customers just give their phone number to the cashier and the reward value can be used as payment. Signage at your location lets shoppers know that they can use their phone number to earn rewards by shopping with you. Wilbur keeps it simple and automatically tracks a separate point balance for every customer at each participating business. Create your own point system, set unique reward levels, and customize the text notifications your customers receive when they earn points. Learn more about designing your program. Wilbur is designed to deliver results without any effort on your part. Even so, we send detailed reports with your loyalty transaction history daily, weekly, or monthly. Many reports are also available via our online web portal. No new equipment is needed. Wilbur is certified with over 140 point-of-sale systems and credit card terminals, so there’s a good chance Wilbur works on the equipment you already use to process credit cards. If you don’t have compatible equipment, you can use our free online portal or smartphone/tablet app to accept Wilbur. Ready to join the Wilbur community? Click below or call 888-494-9760 to get started.